Tuesday afternoon, the Oakland, California, City Council met in a closed-door session at City Hall to learn the details of a new stadium deal for the Oakland Raiders that could keep the franchise from moving to Las Vegas. The stadium effort is being led by a development group spearheaded by NFL Hall of Famer Ronnie Lott, who once played for both the Raiders and the San Francisco 49ers. Council members who attended the session declined comment afterward, but the outline of a deal has emerged. According to media reports, Lott’s group – the Oakland City Pro Football Group – would build a new 55,000-58,000-seat, football-only stadium on the site of the 50-year old Oakland Alameda County Coliseum, which would be demolished. The proposed $1.3 billion stadium would take up 95 acres of the 125-acre site, with the rest being developed by Lott’s group for an upscale merchandise and retail complex, possibly including a motel. Lott’s group will hold another closed-door session with the council next week and the proposal will be made public at a regular meeting of the Oakland City Council a week later. According to reports, Lott’s group, backed by the Fortress Investment Group of New York, would commit $600 million to the deal, $500 million from the Raiders, with another $200 million coming from the NFL’s new stadium fund. The city of Oakland and Alameda County would contribute $200 million in infrastructure upgrades. Lott, who has carved out a pivotal role in the discussions about the Raiders’ future, has been shuttling between Oakland Mayor Libby Schaaf, the city council, the Alameda County Board of Supervisors and the Raiders for the last three months. In the meantime, Raiders owner Mark Davis has maintained that he intends to move the franchise to Las Vegas into a $1.9 billion domed stadium, with a commitment of a third of that total in public funds – about 10 times what Oakland says it will commit in infrastructural improvements for a new stadium. 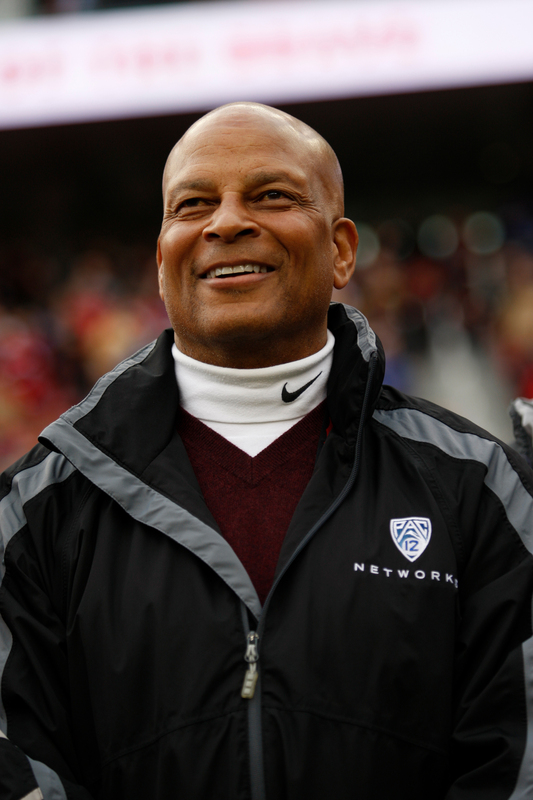 Ronnie Lott stands on the sidelines before the game between the San Francisco 49ers and the Cincinnati Bengals at Levi Stadium on Dec. 20, 2015, in Santa Clara, California. With talks between the Raiders and the city of Oakland on a new stadium at an impasse, Lott’s bid represents the only realistic hope of a deal to keep the Raiders in Oakland. Schaaf, who hasn’t spoken to Mark Davis in months, but met with Lott last week, sounds optimistic. Despite the Raiders on-field success this season, the future of the team in Oakland will continue to cast a large shadow over the resurgence. Early Sunday afternoon of Nov. 3, in a vast stadium parking lot in East Oakland, there was only a roiling black and silver sea of humanity. If you didn’t know better, you’d think that you had defied the time-space continuum and been suddenly transported back 40 years to the glory days of Al Davis and the Oakland Raiders. The sense of nostalgia was strong and unmistakable as a national television audience watched the eagerly anticipated contest between the visiting Denver Broncos and a young, resurgent Raiders squad. Thousands of tailgaters helped prime the loud, raucous but good-natured faithful, with raspy chants of “Raiders!” reverberating among the crowd every few minutes, repeated in unison to no one in particular. A few hours later, the Raiders physically dominated the defending Super Bowl champion Broncos 30-20, taking sole possession of the AFC West at the midpoint of the regular season in the franchise’s most important game since Super Bowl XXXVII, some 14 seasons ago. Yet the smoke rising from the outdoor grills pitched in the parking lot could not obscure the dilapidation of the relic that is the Oakland Alameda Coliseum. Many of the fans wore the traditional black home jerseys of Raiders heroes of glory years past, such as No. 12 of the late beloved “Snake,” Ken Stabler. Others wore authentic replicas of Jim Plunkett’s No. 16, Dave Casper’s No. 87, Howie Long’s No. 75, or even that of Marcus Allen, who also donned the silver and black No. 32, but only as a Los Angeles Raider. There was also an acknowledgement of the Raiders’ newfound success on the field, with fans wearing No. 4 jerseys of precocious quarterback Derek Carr and linebacker Khalil Mack, No. 52, the leader of Oakland’s staunch new defense. There was even a fan wearing a jersey of the one-time Raider who may, ultimately, hold the key to the Raiders’ future in Oakland, No. 42, Ronnie Lott. The Hall of Fame safety, who spent most of his 14-year career playing across the bay for the San Francisco 49ers, has emerged as perhaps the last viable hope for keeping the Raiders in Oakland, saving their fans from the fate suffered by those of the 49ers. “People in San Francisco miss Candlestick [Park] and having the 49ers,” Lott said recently. “It’s affected a lot of people, and that’s before you even bring the economics into it. Lott is one of the principals of the Oakland City Pro Football Group, which reached an agreement in July with the Alameda County Board of Supervisors to develop a stadium development plan. But the 90-day pact expires this month. The group is backed by the Fortress Group, which boasts $70.2 billion in assets. Besides the time constraints, Las Vegas has replaced Carson as a possible new home for the Raiders. Last month, both Las Vegas and Nevada legislators have approved $750 million in public funding for a $1.9 billion domed stadium in “Sin City,” to be ready in about two years. Until very recently, it was expected that Mark Davis would apply to the NFL for relocation in January. But plans for a Vegas stadium have hit a snag. While Mark Davis has promised $500 million toward the new stadium to go along with the public funding, new doubts have been raised about the $650 million pledged to build the new stadium from gambling magnate Sheldon Adelson. Adelson, who is believed to want a share of the Raiders franchise in return for his stadium contribution, said publicly that he can afford to walk away from any deal that is not to his liking. Last week, Mark Davis reiterated his intention to move the Raiders to Las Vegas and added that he will not negotiate a deal for a stadium in Oakland as long as the Nevada project remains viable. In the pantheon of gridiron heroes in the Bay Area, Lott stands shoulder to shoulder with the likes of former teammates Joe Montana and Jerry Rice. While Montana and Lott formed the high-scoring aerial combination that led those legendary Niners squads under head coach Bill Walsh, it was Lott who was the heart and soul of those squads. Pro Football Hall of fame enshrinees pose with their busts in front of the Pro Football Hall of Fame on July 29, 2000, at the Pro Football Hall of Fame in Canton, Ohio. 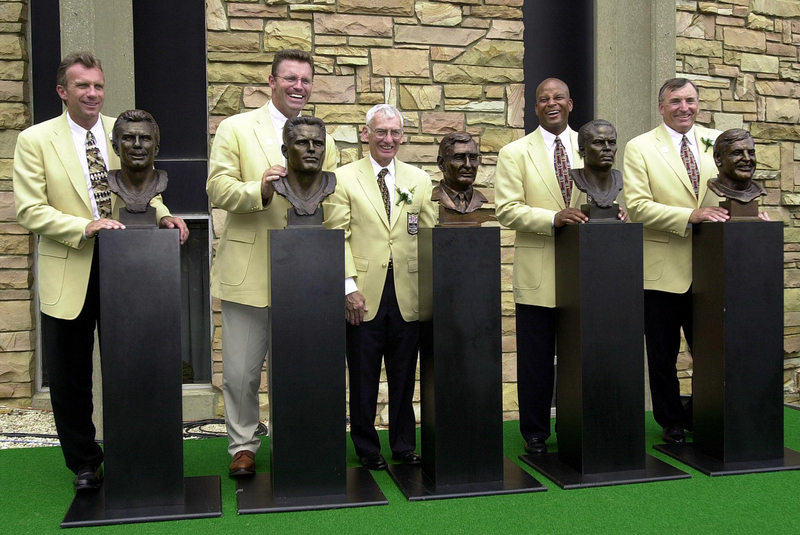 From left are: Joe Montana, Howie Long, Dan Rooney, Ronnie Lott, and Dave Wilcox. 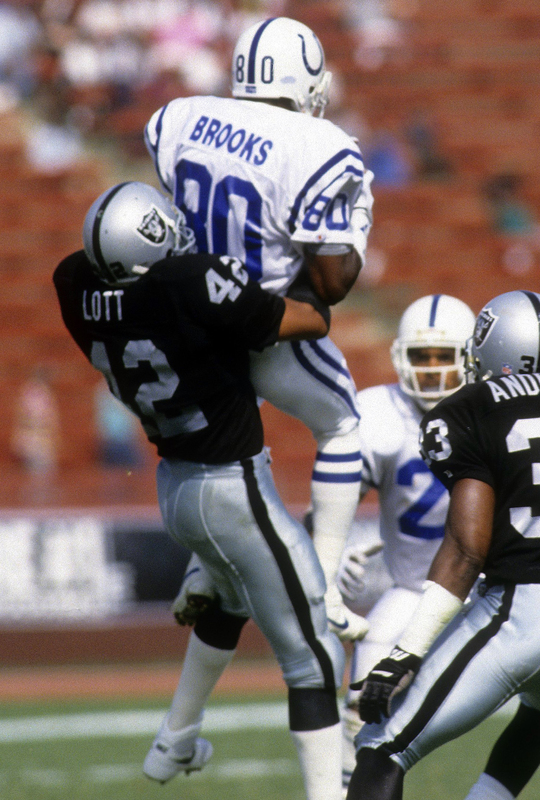 Lott was a heat-seeking missile in the secondary, whose ball-hawking skills and bone-jarring hits often set the emotional tone for big games, helping to form an impregnable last line of defense on four 49er Super Bowl teams. He is, perhaps, best remembered as a player who was so intense that he chose to amputate the part of his left pinky finger to avoid missing a game. Since he retired 22 years ago, Lott has made a smooth transition to life off the field, running two successful car dealerships, being involved as a philanthropist with the Silicon Valley Education Foundation and All-Stars Helping Kids, a nonprofit group that helps local disadvantaged children, among others. A first-ballot member of the Pro Football Hall of Fame, Lott lives in Cupertino, in the heart of Silicon Valley, with his wife and three children. Unlike his persona as a vocal locker-room leader from his playing days, Lott has generally maintained a low public profile since his retirement. He has also tried to avoid the spotlight during his bid to keep the Raiders in Oakland, using the side doors at Oakland’s City Hall to avoid reporters. He did not respond to interview requests from The Undefeated. But those who know Lott well express a strong belief in him, despite the long odds his bid faces. Still Edwards, who watched several efforts by the 49ers to build a stadium in San Francisco without success before finally moving to the 69,000-seat Levi’s Stadium in Santa Clara two years ago, concedes that building a new stadium for the Raiders in Oakland faces several obstacles that may prove too difficult for any group, including Lott’s, to overcome. Yet, Edwards says that Lott’s sterling reputation on and off the field within the Bay Area, and throughout the NFL, may prove critical to this most recent effort to keep the Raiders in Oakland. Although the details of the bid have yet to be made public, it is believed that Lott would like an equity share in the Raiders franchise. The ownership of a major sports franchise by a former player is rare, but not unheard of. Jerry Richardson, a former wide receiver for the Baltimore Colts, became a millionaire operating Hardee’s restaurants before becoming the owner of the Carolina Panthers. Edwards mentioned the more recent transition of Michael Jordan from Chicago Bulls superstar to owner of the Charlotte Hornets franchise in 2010, as well as last year’s purchase of the Atlanta Hawks by a group headed by former All-Star Grant Hill. Workers break apart a section of Candlestick Park as demolition continues on June 15, 2015, in San Francisco. 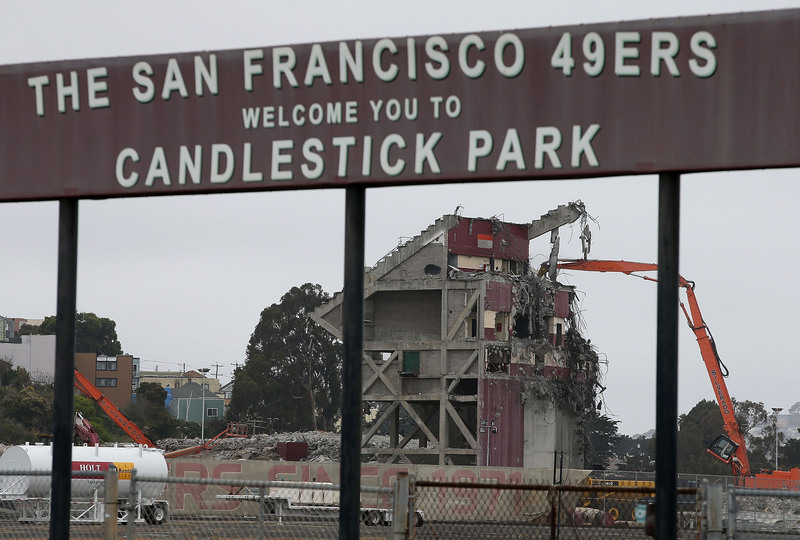 The demolition of Candlestick Park, the former home of the San Francisco Giants and San Francisco 49ers, is in its final stages, with more than 75 percent of the structure reduced to rubble. A development with a mall and housing is planned for the site. And this is a painful reality for many longtime residents of the Bay Area, especially those in the East Bay, who still cling to their blue-collar traditions. For decades, both Hunters Point and East Oakland — both predominantly African-American and long economically depressed — were home to two of the sporting world’s iconic franchises, the 49ers and the Raiders. These communities are part of the Bay Area’s diverse, social quilt. Now both are on the verge of major demographic change, being targeted for redevelopment and gentrification by influx of the wealthy hipster and high-tech crowds from Silicon Valley. Last season, the apparent inevitability of another move hung thick and heavy over the Raiders’ 14th consecutive, non-winning season. Almost a year ago, news emerged that Raiders owner Mark Davis was pursuing a new, football-only stadium in Carson, California, along with rival San Diego Chargers owner Alex Spanos. Ironically, last December, the two teams played in what was billed as the Raiders’ last game in Oakland. The Raiders and the Chargers both applied to the NFL owners for relocation, submitting their Carson proposal. However, the owners rebuffed the joint stadium plan, instead approving the return to Los Angeles of the Rams from St. Louis and the construction of a megastadium in the nation’s second-largest media market. Earlier this year, the Raiders signed three, one-year leases to continue playing at the Coliseum, a relic of the era of cookie-cutter, multipurpose stadiums. Oakland is the last NFL franchise sharing its home field with a baseball team. Before the Broncos-Raiders game, Save Oakland Sports, a noisy, diehard nonprofit group that is attempting to keep the Raiders, A’s and Warriors in Oakland, passed out 10,000 placards that read, “Stay In Oakland” and “Las Vegas: If You Build It We Won’t Come.” They called upon fans to hold up the signs during the game. A plane flew over the stadium in the first quarter with a banner emblazoned with the first slogan. Having survived last year’s aborted return to Los Angeles, many Raiders fans don’t seem discouraged by a proposed future move to Las Vegas. “It’s not gonna happen,” said “Grizz” Jones, a longtime Raiders fan from a crowded tailgating party on 66th Street, across from the Coliseum. 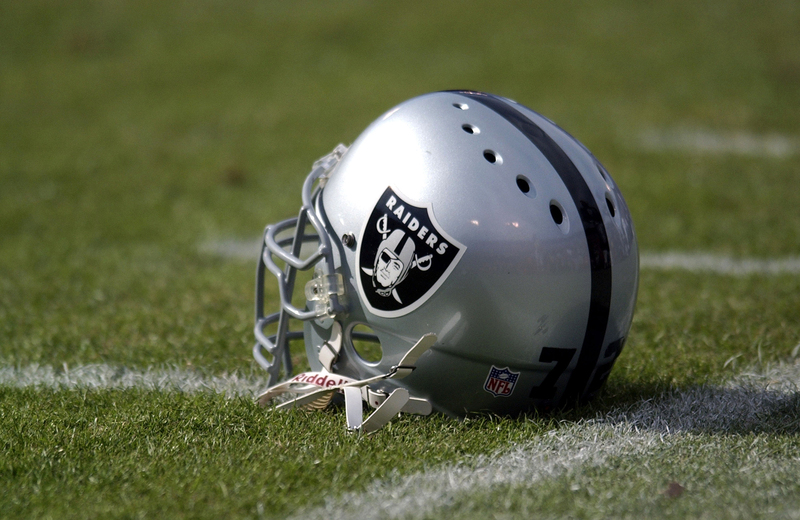 “The NFL hasn’t changed their minds about keeping the Raiders in Oakland at all. The only person that’s tried to go is Mark Davis. But for the NFL, their best interest and it’s as clear as day, Oakland’s the healthy choice. Oakland Raiders helmet on the sidelines. The 49ers defeated the Raiders, 14-10, in the NFL preseason game at 3COM Park in San Francisco, on Aug. 14, 2003 . Jones and other fans expressed their faith that Lott is the man who can get all the moving parts together that will make a new Raiders stadium a reality. Despite this season’s success, with the 9-2 Raiders heading toward the playoffs, it doesn’t change the dire stadium situation faced by the franchise. The coliseum, which opened 50 years ago, is arguably the worst stadium in the league. Despite $220 million in stadium improvements — a $90 million debt remains — that lured the Raiders back from Los Angeles in 1995, the coliseum is falling apart. Drainage for the field, which retains its baseball configuration and dirt infield until October, has always been a problem. Recently, the condition of the facility’s antiquated sewage system has become acute, backing up in dugouts and dressing rooms during baseball games in recent years. There aren’t enough skyboxes or luxury seats at the coliseum. The third level of the stadium has been covered by a tarp for years. Even with the $91 million “Mount Davis,” the 10,000-seat addition built to accommodate the return of the Raiders, the stadium’s 56,057 capacity is the smallest in the NFL. The Raiders haven’t had a stadium to call their own since 1965, when they played the last of three seasons at Frank Youell Field, a temporary 22,000-seat bandbox near downtown Oakland. Before that, the Raiders played their home games across the San Francisco Bay in Kezar Stadium and Candlestick Park. But there’s no doubting the team’s loyal fan base, which continues to make their regular pilgrimage to the coliseum and its industrial area environs. 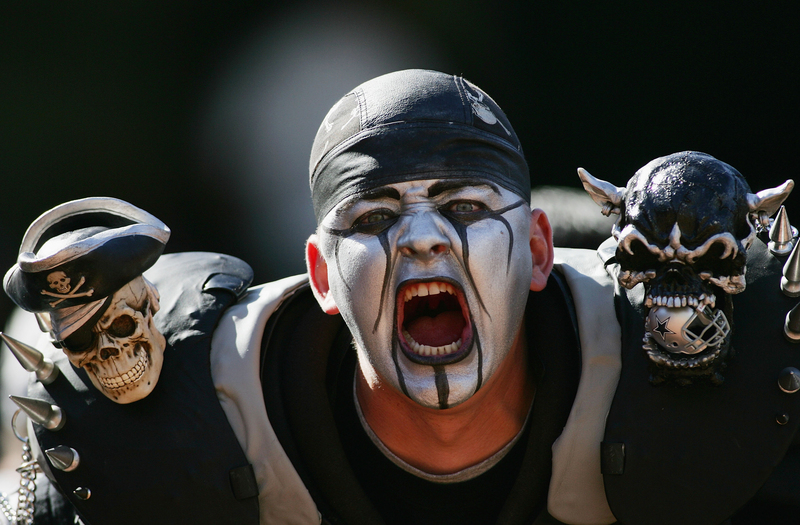 A fan of the Oakland Raiders cheers during the game against the Dallas Cowboys on Oct. 2, 2005, at McAfee Coliseum in Oakland, California. Even if the Raiders don’t move to Las Vegas, it’s apparent that they can’t afford to stay much longer at the coliseum, even if a deal can be worked out to build a new stadium in Oakland. Even if a new stadium were approved on the coliseum site today, it would take at least two years to build. Regardless, the Raiders will need another place to play in the interim. There are two local options, according to Dobbins, but neither appear to be long-term solutions for the Raiders’ quest for a stadium of their own. The first is a temporary move to Levi’s Stadium as a tenant of the 49ers. When it was originally conceived, the Raiders were envisioned as a co-owner, but then-owner Al Davis balked at the idea. Now a move to Santa Clara from Oakland would cost the Raiders considerably more in a lease agreement, while also cutting off money for parking, concessions, skyboxes and private seat licenses – all considerable revenue streams that benefit most other NFL teams. This would add insult to injury to an ongoing feud between the two franchises that goes back 56 years. There is a fierce rivalry between the fan base of each city’s team. Not since the Brooklyn Dodgers-New York Yankees-New York Giants rivalries of the 1940s and ’50s has there arguably been as much mutual disdain between the supporters of teams in such close geographic proximity to each other. The second option would be for the Raiders to move their home games to the nearby, revamped 62,467-seat Memorial Stadium on the Berkeley campus of the University of California. The Raiders used to regularly play exhibition games at the stadium in the 1970s, as well as a memorable regular-season game in 1973. Because of a scheduling conflict with the A’s, the Raiders were forced to play the Miami Dolphins on Sept. 23, 1973, beating them 12-7 on four George Blanda field goals and ending Miami’s 18-game winning streak. But the on-field success was accompanied by off-field stress. Hordes of Raiders fans descended on Berkeley’s narrow streets, producing traffic congestion and parking problems. In response, the city of Berkeley passed the Professional Sports Events License Tax, allowing the city to collect 10-percent of all gate receipts. The Raiders challenged the law and were granted an injunction. The California Court of Appeals subsequently later invalidated the measure. However, the prospect of hosting 10 Raiders home games (eight regular season and two preseason games) and the weekend invasions of the rowdy Raiders Nation would not be popular with University of California’s Board of Regents or many Berkeley residents. But for how long? Oakland’s home teams are past impatient; they’re desperate. Yes, even the Golden State Warriors. The lovable Stephen Curry-Klay Thompson-Draymond Green Warriors, along with new teammate Kevin Durant, are embraced on both sides of the Bay Bridge. But the Warriors, who have played all but one season in Oakland since 1972, are fleeing the refurbished Oracle Arena in three seasons for the San Francisco’s Mission District, the site of the 18,000-seat, Chase Center — a state-of-the-art arena and complex now under construction. The deal is expected to double the value of the franchise to nearly $4 billion. The A’s, the primary tenant at the coliseum, aren’t planning to stay in their antiquated home. They have been desperately trying for more than a decade to build a new ballpark. Forbes magazine ranks them as the third-poorest major league franchise with a market value of about $300 million, making it difficult for the A’s to field competitive squads or retain its best players. The A’s quest for a suitable new home mirrors the frustrated odyssey of the Raiders in many respects. Major League Baseball will not grant the A’s permission to relocate to San Jose. There were failed plans for a new stadium in nearby Fremont. The ball club is now in negotiations with the city of Oakland to build a downtown, baseball-only park at Howard Terminal in the port of Oakland. So, it appears the A’s will be forced to share AT&T Park with the Giants in San Francisco for a few seasons, an idea they have long resisted. According to Forbes, the Raiders ranked near the bottom of the league in revenue last year, making about $40 million for eight home games. When the Raiders played a Monday night “home” game in Mexico City against the Texans two weeks ago, the league grossed $22 million and the game drew about 30,000 more fans than if the game had been held in Oakland. A new stadium would level the playing field for the Raiders in a league where more than a dozen franchises have moved into new state-of-the-art stadiums. Noll, who has written extensively on the economics of stadiums, argued that the positive impact of a new Raiders stadium, even at the current site, would be negligible. Both the city of Oakland and Alameda County are strapped for cash and have only offered $95 million in infrastructure improvements, far less than Las Vegas. But Noll added that the proposed deal to move the Raiders into a new stadium in Las Vegas is far from a sure thing. Noll cites the league’s long prohibition on gambling. He also said the NFL would never force an owner like Mark Davis to sell part of his team and that many owners would oppose selling part of the Raiders to Adelson, given his considerable gambling ties. And, ultimately, this may scupper a Vegas deal for the time being and give Lott’s bid a chance. Still, Noll added, there is a charisma and a mystique to a former athlete like Lott that is intangible. But, ultimately, a new Raiders stadium is a quid pro quo proposition. If the Lott group is able to pull off a deal to keep the franchise, as well as the A’s in Oakland, what would they get in return? Currently, they have a deal to get the rights to develop the coliseum site tax-free, but would they also demand a share of the Raiders, the 21st most-valuable NFL team at $2.1 billion? That may be the most contentious issue to negotiate, especially at the 11th hour. In the end, even the presence of Lott may not be enough to prevent the departure of Oakland’s first major league franchise and, perhaps, the most iconic piece of what still remains a blue-collar town.